Frasaco USA serves the specific needs of each and every one of our customers. 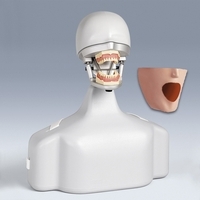 To do this we provide the absolute highest quality products and services for dental education, demonstration and simulation at a competitive price. Product pricing is available by quote only. To request a quote, simply fill in a quantity for the products that interest you and click the "Request A Quote" button. Fill out your contact information and submit your request. A representative will respond to your request shortly. 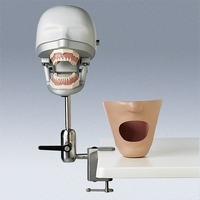 Most widely used phantom head in the U.S. and Canada, features solid state construction, fully functional articulator that most closely replicates human jaw movement. 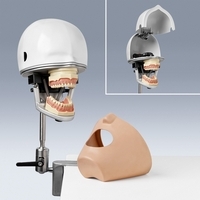 Mannequin head, offered as a kit to include watertight face mask, typodont, and stainless steel clamp-on bench mounting assembly. 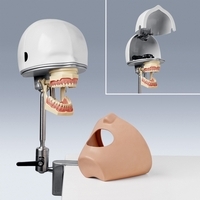 Mannequin head, offered as a kit to include watertight face mask, typodont, and life-size torso for dental chair mounting; known as our "Patient Simulator". Alternative version of the premium head, this economical version offers the same jaw functinality but in simpler construction and design. 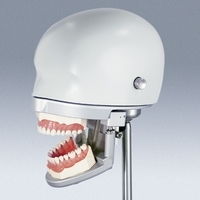 Mannequin head, offered as a kit to include watertight face mask, typodont, and life-size torso for dental chair moutning. 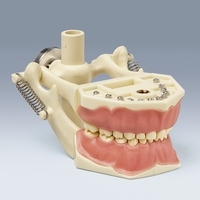 A third option for tight budgets, similar construction to the PK-2 but without the articulating jaw assembly; instead utilizes hinged typodonts. 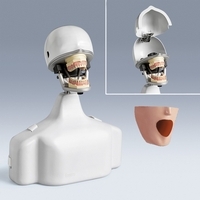 PK-1 TSE mannequin head, offered as a kit to include watertight face mask, typodont, and life-size torso for dental chair mounting. 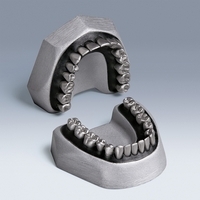 Latest generation typodont offers the highest accuracy, consistency, and repeatability available in a typodont. 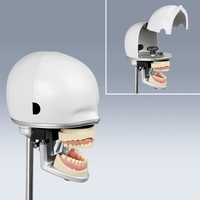 Ideal for restorative and prosthodontic courses. Separate upper and lower arches with 28 screw-retained teeth and soft gingival shrouds. ANA-4V standard typodont, complete with hinge assembly. Available individually for use with ANA-4 series typodont. 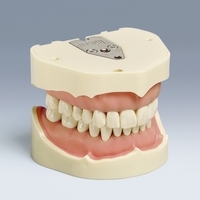 Unique teeth are specially treated to eliminate the need for powder when using with CEREC Blue Cam system. 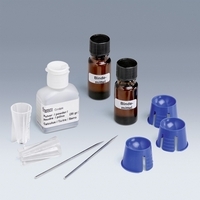 Please contact for more information about our assortment of available preps for use with the ANA-4 series typodont. 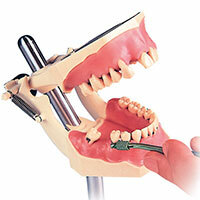 Similar to ANA-4V but utilzing click-in/click-out style replacement teeth. ANKA-4V standard click-system typodont, complete with hinge assembly. 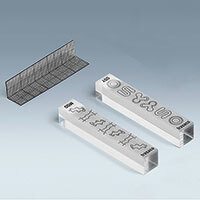 Available individually for use with ANKA-4 series typodont. "Scannable" click-style replacement teeth, specially treated to eliminate the use of powder when using with CEREC Bule Cam system. 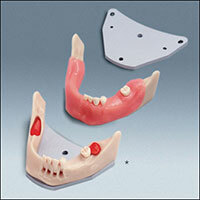 Please contact for more information about our assortment of available preps for use with the ANKA-4 series typodont. Versitle typodont suitable for many educational purposes. Dentition of 32 screw-retained teeth and soft gingival shrouds. Standard AG-3 typodont, complete with hinge assembly. 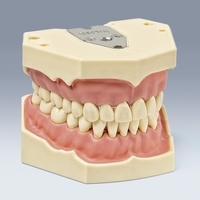 Standard replacement teeth for use with the ANA-4 series typodont. 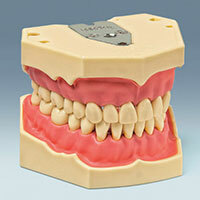 Pre-prepared and specialty teeth are also available for the AG-3 series typodont. Basic shapes and prep designs, helpful when developing early preparation skills. 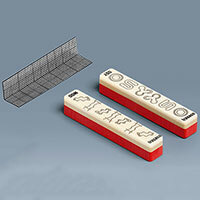 Includes 2 acryllic blocks with 13 cutting designs; also includes millimetric control guide. 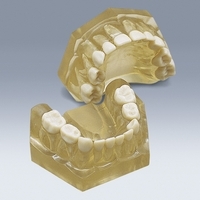 Similar to A-PT training blocks, but features plastic multi-layer blocks simulating the cutting characteristics of enamel, dentin, and pulp layers. 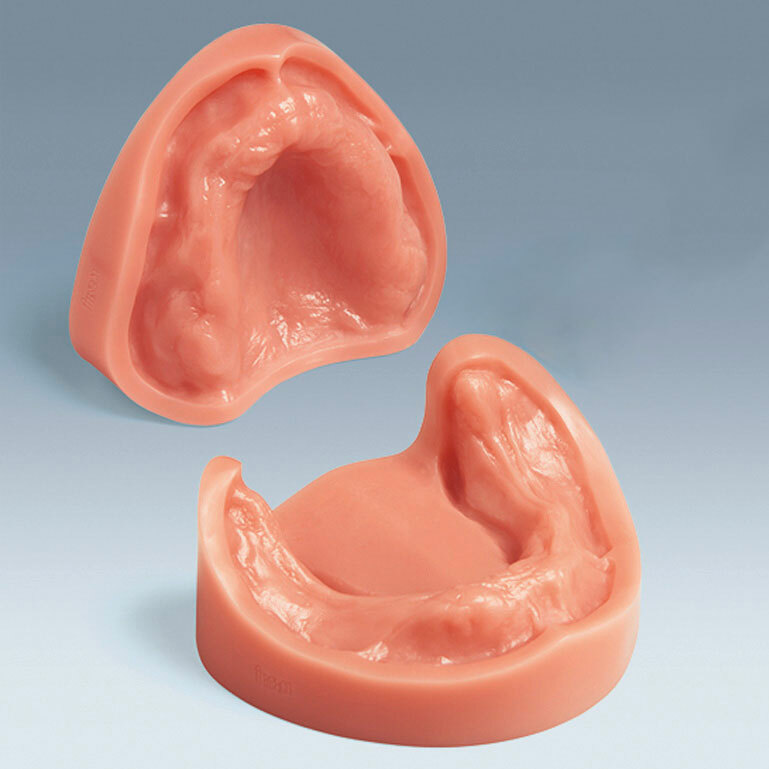 For removeable prosthodontics, hard plastic model designed with natural anatomy; built along the same general size and shape of the ANA-4 series typodont. 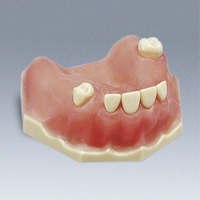 Bite registration block also available. 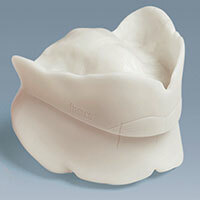 Similar anatomy to the B-3 CSP; new option features a soft-tissue gingival shroud ideal for bordermolding. Base consists of artificial bone material. 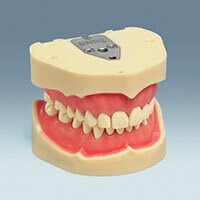 Bite registration block also available. 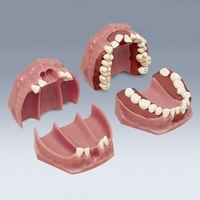 For use within mannequin heads, bite registration block achieves vertical dimension of occlusion in edentulous typodonts. Excellent typodont for Dental Hygiene. Represents moderate to advanced stages of periodontits, features gum recession and clefting, bone recession, perio pockets, and synthetic calculus suitable for scaling. 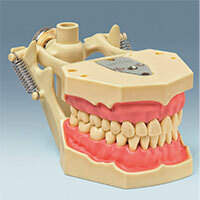 A-PZ periodontal typodont, complete with hinge assembly. Similar to A-PZ periodontal typodont, however features shaded red transparent gingival shrouds for subgingival observation. Represents severe stages of periodontosis. Features heavy calculus deposits, advanced gum and bone recession, root exposure, and multiple areas of tooth loss. 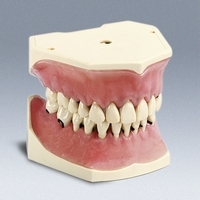 A-PB periodontal typodont, complete with hinge assembly. 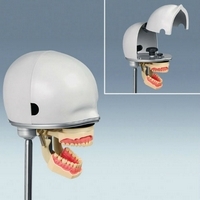 Standard healthy dentition, features softer gingival anatomy suitable for instrumentation. Also available with hinge assembly AG-3H DA (Item #40300680). 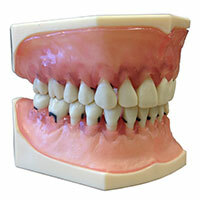 Two-part calculus kit allows the mixture and reapplication of synthetic calculus on typodont teeth. Battery-operated electronic model produces an audible hit tone when contact is made with dry needle on to embedded nerve sensors. Shown with optional mounting kit (Item# A-PZ KR DA). 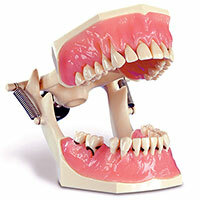 Pediatric typodont features 20 standard deciduous teeth and 4 permanent molars. Separate upper and lower arches. AK-6/2 pediatric typodont, complete with miniature hinge assembly. 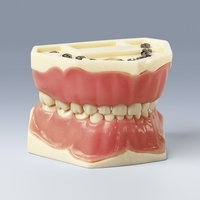 Deciduous model teeth with screws, pulp chamber filled with red wax for pulpotomy exercises. 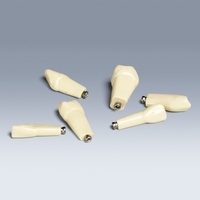 Available in position A, B, C and T.
Deciduous model teeth with screws, hollow pulp chamber for pulpotomy exercises. Available in position A, B, C and T.
Available individually for use with AK-6/2 pediatric typodont. 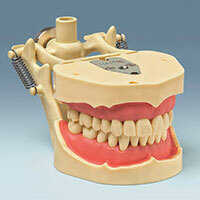 Demonstration model features 20 removeable, friction-fit teeth with anatomically formed roots. 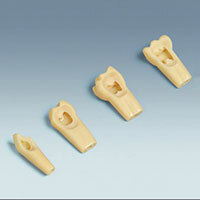 Unique training typodont is supplied with eight fixed anteriors. 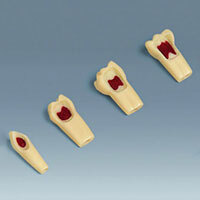 Remaining teeth are supplied loosely for embedding into typodont using wax for banding and bracketing. 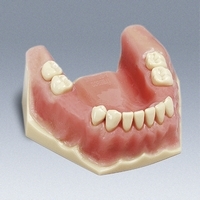 Wax can later be heated, causing teeth to move into desired position. 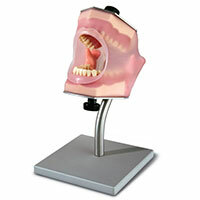 Maxillary oral surgery model features a palatally displaced canine; incisor and premolar suitable for root resections. 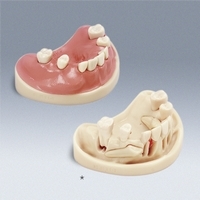 Mandibular oral surgery model features a displaced wisdom tooth; canine suitable for root resection. 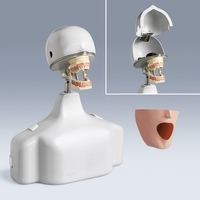 Maxillary oral surgery model features partial dentition, impacted canines, cases of granuloma suitable for exercises involving apicoectomy. Mandibular oral surgery model features partial dentition, impacted third molars, cases of granuloma suitable for exercises involving apicoectomy. 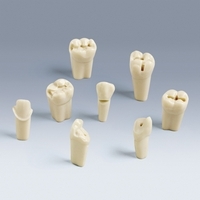 Examples of bone pocket and fenestration suitable for guided tissue regeneration. 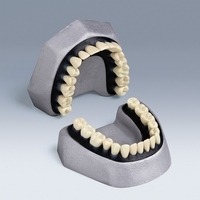 Highly-acclaimed model for beginning exodontia training features a dentition of 32 CrNi metal teeth for immense strength during extraction exercises. 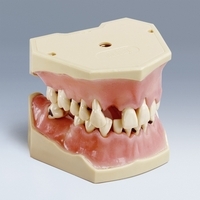 For advanced courses, this model features 32 teeth in plastic resin. Students are challenged to learn proper technique and hand pressure, as teeth will fracture under excessive force.